The ACE Hotel complex. New York City. It is not often we find solace amidst the busy cities of the world. The noise carries like a freight train, echoing in the distance and the hum of cars and people going about their daily routine are at times, overbearing and inescapable. New York City has been for many years, the fall guy for this stereotype of a city and yet, has made a miraculous attempt to draw the city back and create centres of relaxation, calm and style. 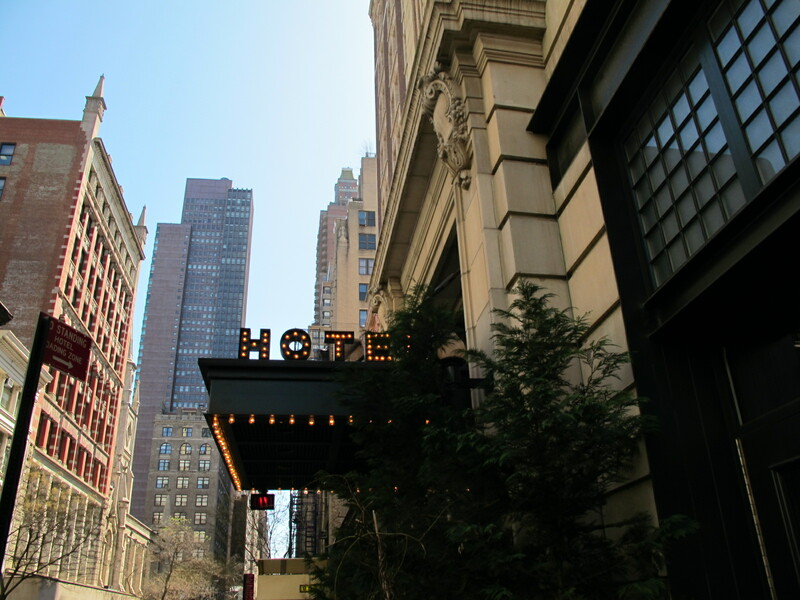 The ACE hotel complex on Broadway between 28th and 29th Streets achieves comfort and escape with a standard well above many other institutions in the city. They successfully deter from the exclusivity so many places of this calibre maintain by illustrating a charming selection of dining options under the one roof. Formally the Breslin hotel, the lobby is dark with dim lighting hung from the high whimsical ceiling resembling 1920’s décor split into various sections in a rather large space for a NYC hotel. Off to the right of the entrance a desk that appears to look more like a t-shirt store is the check-in area and is over staffed in anticipation of arriving guests (and yes, you can buy t-shits and bags with the ACE logo). The classic style of the building ensures the hotel is tucked away from the dining areas in the lobby and allows for special access to guest only areas beyond the first floor. The rooms are available in six different sizes ranging from loft and large rooms down to small and bunk style rooms. Most rooms have hardwood floors and views of the city along with the modern luxuries of wireless and tv. Starting prices range from $299 to $1,299 per room per night and are all newly renovated modern classics. The Breslin Bar and Dining Room is the next instalment for April Bloomfield and Ken Friedman, owners of The Spotted Pig in Greenwich Village and is their latest Michelin-starred restaurant. With lobby and street front access, hotel guests and passerby’s can enjoy the rich, indulgent flavours that dominate the hearty, meat-orientated dishes served up. The Breslin pay close attention to small farmers and use seasonal availabilities to enhance their dishes within the wide boundaries of their “nose-to-tail” philosophy made so famous at The Spotted Pig. 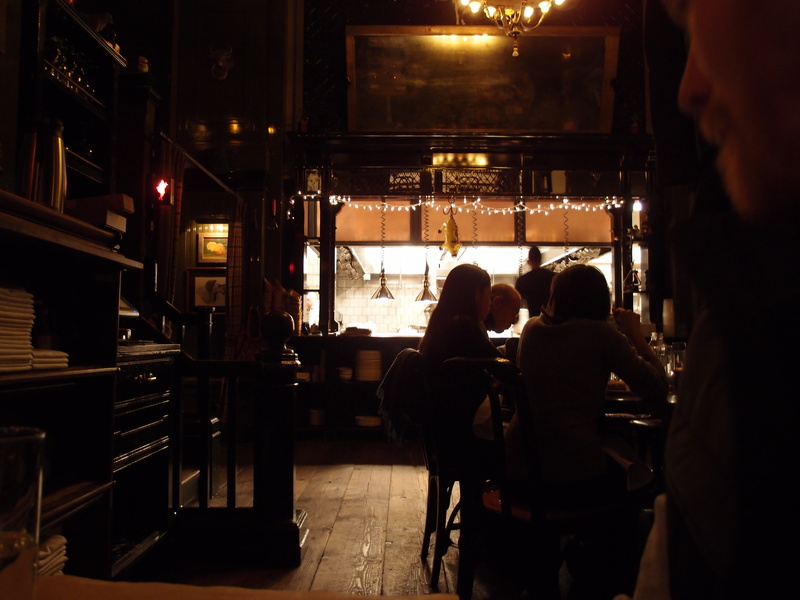 As the name suggests, there is a separate bar to dining area however, the bar is predominantly filled with anticipated dining guests waiting for their chance to be seated. There is a no booking policy but like most restaurants in New York, a wait is never far away and with long opening hours, The Breslin offers breakfast, lunch and dinner daily offering eight different menus between the bar and restaurant throughout the day. The Breslin spills out into the vast lobby area also, offering a lobby bar for those that wish to drop down for a slightly more quiet drink on one of the many couched and large table areas the restaurant and bar share with Stumptown coffee, also a member of the ACE complex. 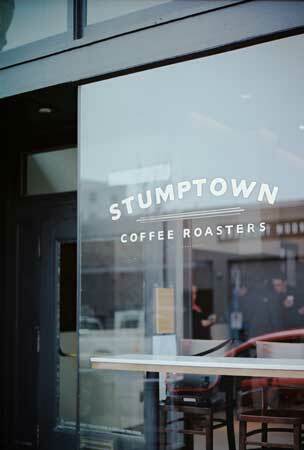 Stumptown Coffee resides next door to The Breslin and is a Portland, Oregon based coffee purveyor. The store itself is quite small yet large in comparison to traditional New York City coffee outposts. Specialising in coffee and coffee alone, a small range of pastries and sweets are available at the counter however a smaller menu of muffins, bagels and savoury snacks are available in the lobby bar, wherever it is you choose to sit. The coffee itself is among the best in Manhattan, I may be bold enough to state, some of the best in the USA on a whole, as Stumptown have perfected the traditional “brew” of American style peculator coffee whilst generating some buzz surrounding milk based coffees often found predominant elsewhere in the world. The barista’s are highly skilled and love the opportunity to discuss their craft – if there is ever a break in the line of orders to go. The milk coffee does fall short of the rich, black coffee however I believe with more demand for milk based coffees, the transition will be swift and powerful. The complex also includes the John Dory Oyster Bar, a project of April Bloomfield with her chef Josh Evans from The Spotted Pig which is synonymous for seafood orientated dishes and cocktails with an emphasis on sharing. The newly established no7sub, a New York based sandwich store with a gourmet twist from across the river in Brooklyn also inhabits a store next to the Oyster Bar. A coffee and food oasis amidst the hustle and bustle of Midtown, the ACE hotel complex including the hotel, Stumptown Coffee, The Breslin, John Dory Oyster Bar and no7sub with its romantic and modern bohemia style is a true representation of the local culture in New York City. It celebrates the complexities of food in its various forms, the experimental and growing third wave coffee scene and the art of homemade culture and experiences with an emphasis on history, not only of the building but the surrounding area and its significance. ← The many social and artistic layers of Ciudad de Mexico. I’m impressed, I must say. Certainly rarely do I encounter a weblog that’s both educative and entertaining, and let me tell you, you’ve hit the nail on the head. Your thought is outstanding; the concern is something that not enough many people are speaking intelligently about. I’m extremely happy that I stumbled across this in my search for something relating to this. I was particularly pleased to discover this web-site.I wanted to thanks for your time for this marvelous read!! I definitely enjoying each small bit of it and I have you bookmarked to check out new stuff you weblog post. Youre so cool! I dont suppose Ive read something like this prior to. So nice to acquire somebody with some original thoughts on this topic. realy thank you for starting this up. this internet site is something that is needed on the web, somebody having a little originality. beneficial job for bringing something new to the net!